You have waited, you’ve saved, and have spent years dreaming about buying a new home. Now that you’re actually ready and able to buy that home you have learned that it’s a seller’s market. Well, what not to do is to think that buying in a seller’s market isn’t possible. Yes, it might be a little more challenging than if you were buying a home in a buyer’s market. However, if you know how to tactfully maneuver through the process, you will probably find that you were able to snag the house of your dreams without too much hassle and without breaking the bank. Yes…you can easily buy a house in a seller’s market and here’s how. But first, let’s clarify what is considered a seller’s market in the first place. Then we will go over some tips, tricks, and strategies on exactly how to go about buying a house in a seller’s market and the most common mistakes you will want to avoid. What Is Considered a Seller’s Market? In real estate, a seller’s market means the demand for housing is greater than the available supply. In a seller’s market, you will frequently see a number of buyers competing to buy the same house. Those buyers will continue to try and outbid each other, which drives up the price of a home. So basically, a seller’s market is when there are more home buyers than there are home sellers and the month of housing supply is below 6 months. When trying to determine if your area is currently in a buyer’s market or a seller’s market, there are a few variables you will need to analyze. Finding the answers to these questions will tell you everything you need to know. And, of course, if you want to keep it simple, you can contact your real estate agent and he/she will know from experience and from working in that market whether or not your area is currently in a seller’s market. However, here are the variables that will tell you if your area is currently in a seller’s market. Determining the average number of days the houses in your area have been on the market is one indicator of whether you are in a buyer’s market or seller’s market. If the houses in your area were only on the market for a few weeks before being sold, then you are in a seller’s market. However, if the houses in your area have been on the market more than a few months, then you are in a buyer’s market. For more detailed information about the real estate trends in your area, you can use the Realtor.com Local Market Trends tool to assist you. In a seller’s market, bidding wars can quickly drive up the price of a home to well above the listing price. So if you find the final sold prices are consistently higher than the listing price you’re in a seller’s market. And if you find the final sold prices of the area homes are consistently lower than the listing price, this is generally an indication that you are in a buyer’s market. Typically, in a seller’s market, the final sold price of a home will be about 10% (at the very least) higher than the seller’s asking price. This is an indication there was a bidding war that drove up that price because of the limited number of available homes in the area—aka a seller’s market. If you want a tool that can help you compare listing prices versus closing prices of homes in any given city in the country, you can go to this lakelandfloridaliving.com/lakeland-real-estate page to search area neighborhoods. If upon researching home prices in your area you have discovered the prices have been continually rising over time, then you are in a seller’s market. If they have been continually declining over time, then you are in a buyer’s market. If you don’t know, you can use this BuilderOnline.com tool to find out. If you want to save yourself a bunch of time, consult with your real estate agent about the current state of your local market or the area you are thinking about buying a home. Your real estate agent can quickly and easily compile all the information you need to make an educated decision about how you want to proceed. So go ahead and take advantage of your real estate agent’s knowledge and experience. 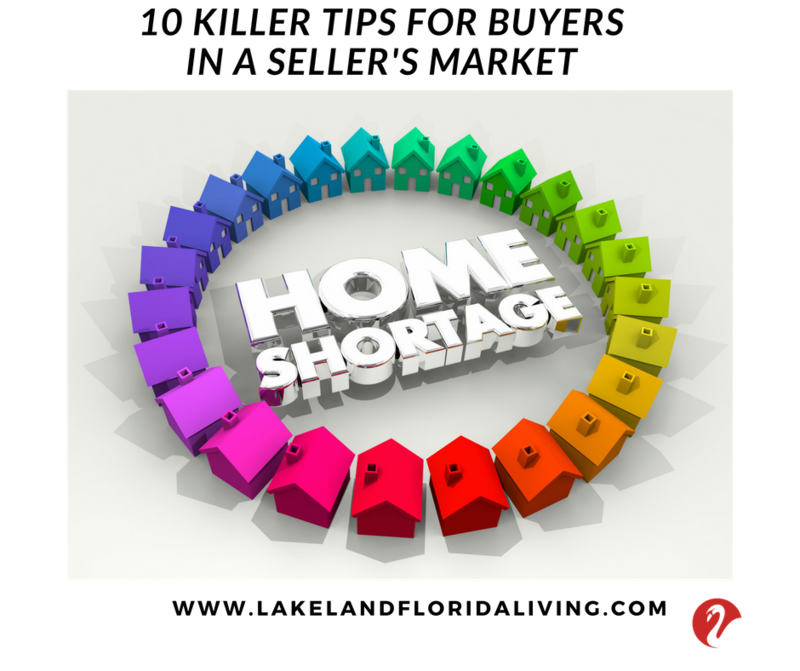 If you want to buy a home in a seller’s market, you have to be quick and you have to be prepared. Being prepared means understanding the tips and tricks for buying a home in a seller’s market and proactively initiating them. When buying a home in a seller’s market, you have to have all your ducks in a row, so you are ready to immediately jump on a house once you’ve found one. Here are the best ways to do just that. Get preapproved not just prequalified. Don’t submit a lowball offer—you WON’T WIN! Submit an offer with few to no contingencies, preferably no contingencies (this is huge)! Put down a large earnest money deposit to show the seller you are a serious buyer. And, make sure you attach your earnest deposit with the offer rather than providing it later. Submit a higher than asking price offer before someone else does. Don’t voice your dislikes about the house in front of the seller. Make it known that you love the house. Many sellers’ have an emotional attachment to their house and want it to go to someone who will love and care for it like they do. You can do this by writing a personal letter to the seller expressing your heartfelt feelings about why you want their house. If possible, offer to close on the house based on the seller’s needs, whether that be quickly or an extended period of time, even if that means you will need to secure temporary housing in the interim. Include an escalation clause in the contract rather than a single price offer. An escalation clause will provide the seller some reassurance that if someone else presents a more competitive offer for their home after he/she has accepted a contract from you, they can increase the price of your contract on their home to the higher price as long as it’s within the maximum limits you specified in the escalation clause of the contract. Doing so will give the seller more incentive to accept your offer rather than trying the “wait and see” approach. When trying to buy a home in a seller’s market, there are some mistakes buyers commonly make. Here are some of those mistakes and how to avoid them. This is the number one most common mistake buyers make when it comes to buying a home in a seller’s market. If you are one of those people who has to see everything and know everything before making a decision, buying a home in a seller’s market could cost you. Therefore, if you find a home you like, jump on it before someone else does. You can analyze and assess everything later and if the house turns out to be a dud, you can cancel as long as you do so within the allotted amount of time specified in the contract. When you are trying to buy a home in a seller’s market, there’s no time for the inexperience of a real estate agent who doesn’t know exactly how to help you snag an in-demand home before someone else. So find a real estate agent who knows all the ins and outs of the “hot-market” home buying process. Find a real estate agent with the experience and enough tips and tricks up their sleeve to secure the home you want before you lose it to someone else. In a seller’s market, you should expect and be prepared for a bidding war. Then, if you are the first fast responder to a new listing and actually get to that home before someone else, then great—no harm done. However, if you don’t expect a bidding war, you will probably lose that house, as well as go through the emotional pain of losing the house of your dreams, especially once you’ve finally found it. The way to be prepared is to look for homes that are under your designated budget so you can make bids that are over the asking price without breaking the bank. Once you’ve tried several times to buy a house in a seller’s market, but keep being outbid, it’s easy to become frustrated and throw in the towel. Don’t do it! Just remember, there will always be another house—ALWAYS! So just keep on keeping on and chances are you will ultimately end up finding a better house than the ones you lost. Take your time, be patient and everything will come together, guaranteed…you’ll see. Buying a house in a seller’s market can be done cost-effectively if you know what to expect and how to proceed. Don’t let a seller’s market cause you to put off your home buying decision. 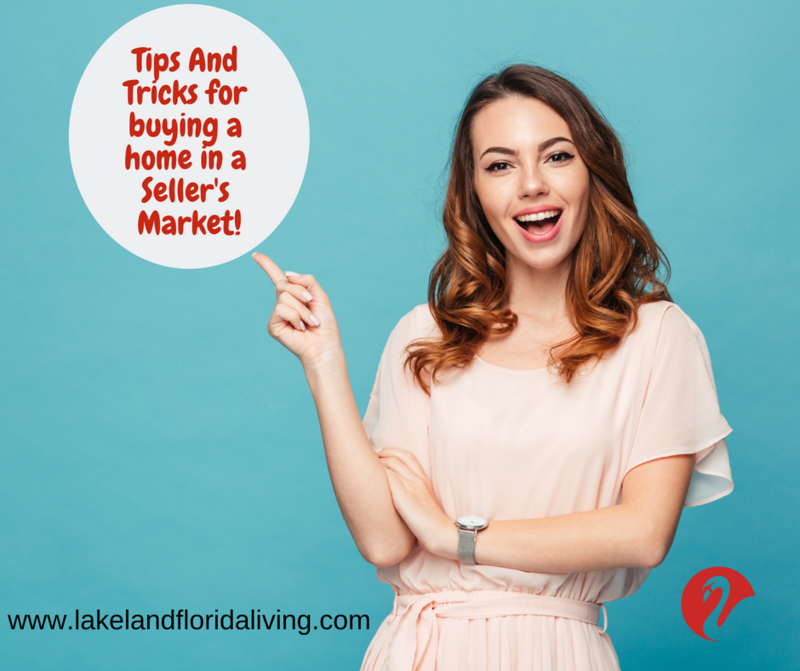 Take a few minutes to learn the tips and tricks of buying a house in a seller’s market so you are educated enough to act quickly once you’ve found one. Then contact your real estate agent for more information. You’ll be glad you did. And before you know it, you will be living in and be enjoying your new home and all it has to offer. If you would like more information about buying a home in a seller’s market, please Contact Us today. We would be happy to assist you in any way with can with all your real estate needs.